Have a total sum in the middle and the two buttons around it. From memory, it requires some css hiding. Try adding the <txp:cbe_helpful_score /> (where necessary with class and wraptag) to the middle of your code, then examine the code output and hide the bits you don’t need from the other tags with css. 2. 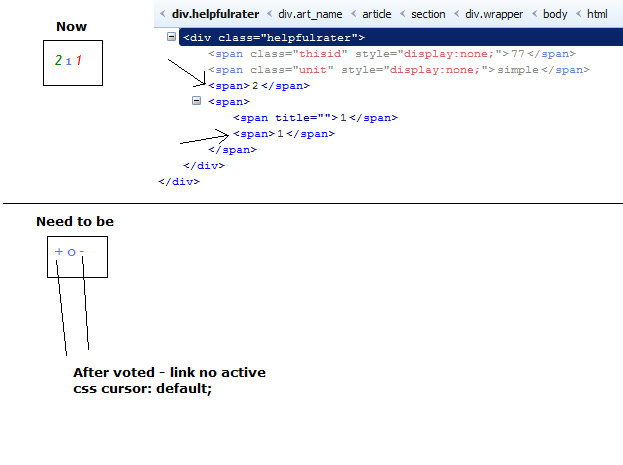 How to make after the vote + – were not removed, but simply become inactive css cursor: default; ? 3. How to make to be able to vote either + or -. Now I can vote, + and – too. ? where i can change the function that does the INSERT into the table `cbe_helpful_votes`? I have installed Nginx + Apache, and I would like to change the variable $_SERVER[‘REMOTE_ADDR’] to $_SERVER[‘HTTP_X_FORWARDED_FOR’]. Welcome to the forum, Hidalgo82. I see it on line 349. In case you’re new to Textpattern: Go to Administration > Plugins > Click cbe_helpful and search for $_SERVER[‘REMOTE_ADDR’] . After you’ve done your edit, click save.